elixer coffee provides the community with a unique platform and destination to get the finest coffee and italian based beverages. 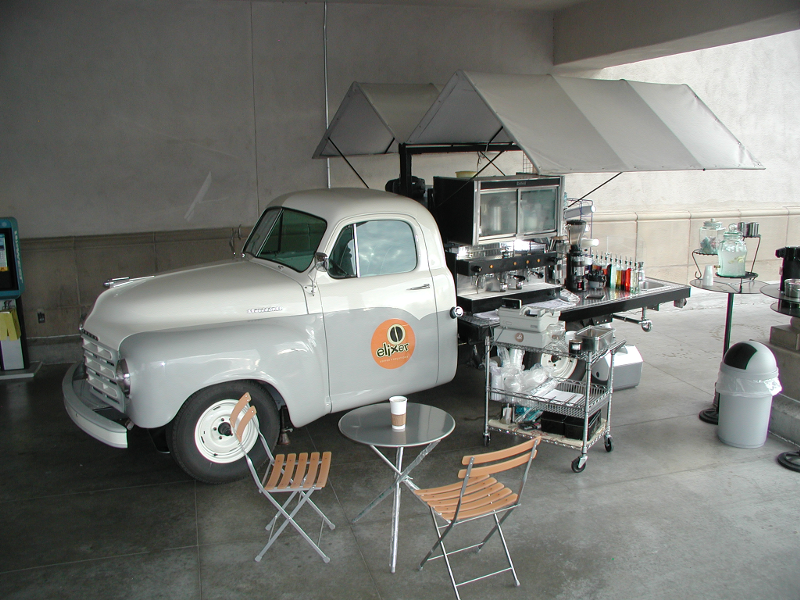 They operate a retrofitted 1952 Studebaker truck with a fully equipped espresso bar on the back. It is a classic marriage of Americana with the outdoor cafe feel of Europe. They say they are strongly committed to sustainable practices throughout our business and educating consumers of better choices. Click on thumbails to see full-sized images. Renee Wold: elixer sprang from a sketch on a coffee shop napkin. I was baristing at a local café, while working at a bakery, and doing surgical assist for an area periodontist. Imagine three jobs not being able to make ends meet, and having very little satisfaction while not having my ends meet. My boyfriend, an out of work aerospace guy with a pension for making napkin sketches come to life, out of sheer playfulness answers the unique feature of my business for this query. He is; dare I say a little eccentric when it comes to sustainability, recycling, and the fusion of passions. The passion I speak of is the love of coffee and the perfection of the craft. The unique feature of the business is the restoration and recycling of a 1952 Studebaker ½ pick-up truck. The box bed was replaced with a flatbed to which was mounted an espresso machine three grinders, a coffee machine, a dairy refrigerator, a freezer, four sinks (one hand sink and a three well as required by local the Health Department), a hot water heater, fresh water storage, and gray water retention. Most of this equipment was used and restored to the same ridiculous/meticulous specification as the truck. As for influences; while researching to bring this endeavor to life we started learning about coffee. I have been serving coffee at some level since college and was stunned at the things I didn't know. We have shelves of books on the subject of coffee and its history. One thing we've learned, "over 25 million families depend on coffee as their sole source of income." We have over 25 million influences. These people are our influence and our motivation. Corruption, greed and bad business practice has kept these nameless people silent; it is our goal to be their voice. economy and their importance to the vitality of the local community? We see the future as we saw today yesterday; changes will happen, we will adjust. The current economic situation has brought to center stage the small business. Disproportionate attention paid to real estate, and financial sector while small business was left to survive by its own devices has certainly shown that there are some clever entrepreneurs willing to do what it takes to continue their mission. To us the true beauty of the small business model is its ability to change, respond, and relate to and with the community. As we are also part of the community, we know how we feel; we consequently know how the community feels. Please find a copy of Black Gold, the movie (the library usually has it). Take a few moments of your life; take this short trip around the world of coffee. See it through our eyes. In our café as in idea café, people come to socialize and to freely exchange ideas. If your goal is to support small business that have local as well as global impact the results your vote can bring will be crafted into a thing of beauty, if not, we're going to continue one cup at a time. That is our continuing responsibility and commitment, whatever the platform may be. Submitted by D. (not verified) on Tue, 12/16/2008 - 21:19. Submitted by Darren Tabor (not verified) on Wed, 12/17/2008 - 00:54. A clever idea and an impressive implementation. 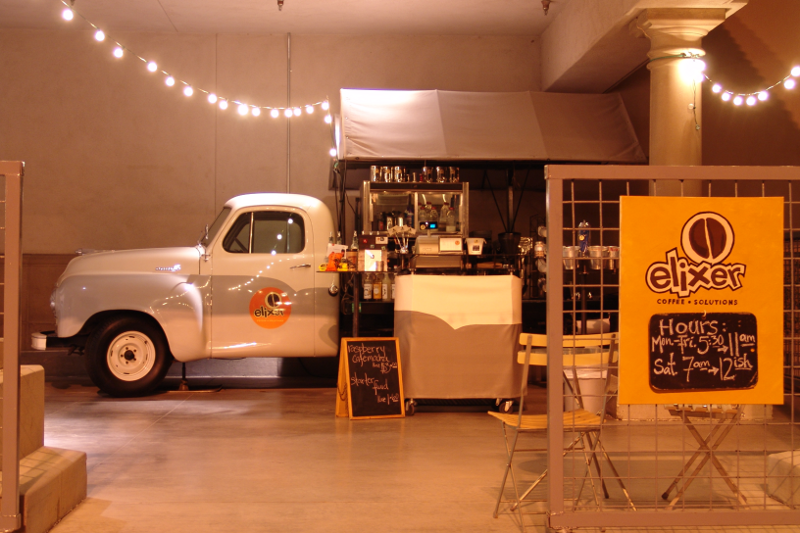 How could you NOT buy coffee from a 1952 Studebaker? Too cool. Submitted by Eric (not verified) on Thu, 12/18/2008 - 22:29. Amazing platform! What Renee has created brings a smile to everyone's face. The truck aka " Roscoe " is ingenious. People from all over have taken pictures at elixer even as far as Yuji from Japan! Renee has touched a lot of people with such a charming atmosphere. Thanks for always being there for us and touching so many peope with your wonderful smile and passion to our community, the global community and everyone in between, including four legged friends. Submitted by Christy (not verified) on Thu, 12/18/2008 - 22:33. Beautiful idea. Beautiful lady. Amazing breve cappuccinos. Renee is such an inspiration. Submitted by Jenna (not verified) on Wed, 01/07/2009 - 20:27. Renee is such an inspiration. She has faced more obstacles and remained positive and able to persevere with grace and compassion. As cool as the truck is, she brings people together and we never would have met or connected with such great people in the community without her. She is so knowledgable about coffee and the quality of her drinks is unreal. She always says the proof is in the cup and knowing she cares about how she conducts her business and educating us on the coffee trade allows us to make better choices. I always learn something new from her and she is always there to listen. She makes me feel special and knows exactly what I want as well as my kids. Saturdays are so special there because so many families show up and there is no limit to what she will do to make everyone feel like family. I am so excited for you Renee and so glad to see your business being recognized for how remarkable it is.